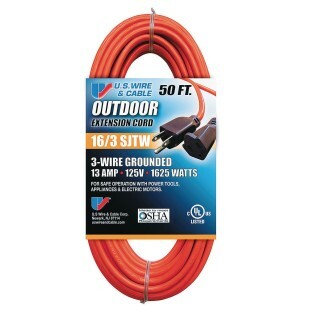 Standard hard service 16/3 vinyl indoor/outdoor extension cord. Double insulation and molded-on plugs. SJTW, medium flexibility vinyl cord set. Standard hard service 16/3 vinyl indoor/outdoor extension cord is constructed with double insulation and molded-on plugs. Orange, non-marring outer jacket. Packaging includes consumer information for easy selection of desired cord type. SJTW, medium flexibility vinyl cord set. 50 feet long. Standard 3-prong grounded connections.